“Perhaps, I thought, lying on the hall floor, I will just stay on the hall floor forever, and sink through the laminate, and into the concrete, and down into the earth. But this is a hopeful story. It’s the story of how I got up off the floor. 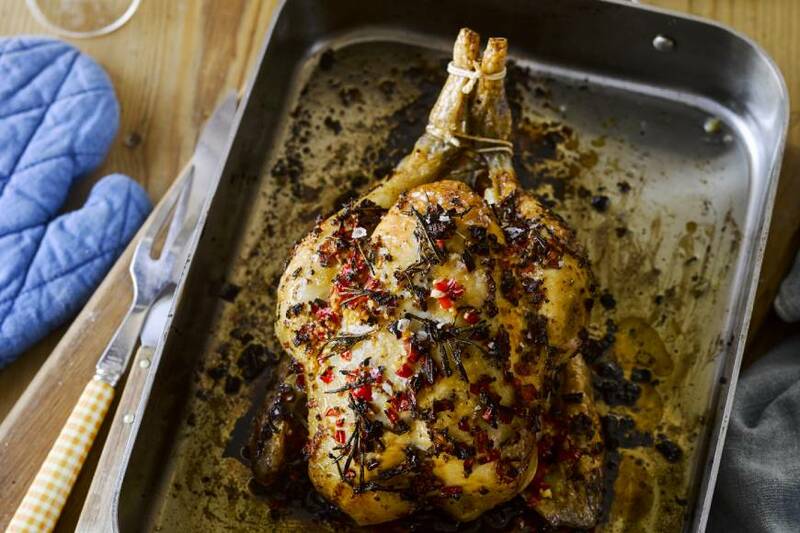 It’s also the story of how to roast a chicken, and how to eat it. This is a story of eating things, which is, if you think about it, the story of being alive. More importantly, this is a story about wanting to be alive. “Eventually the Tall Man came home, and helped me up. ‘Come on,’ he said, and we went into the kitchen together, and I made this, late at night, and we ate it at midnight, with wine, and bread, and our fingers, sopping up the garlicky juices from the baking tray, sucking the bones. 1. Take your chicken out of its packaging. Sit it in a baking tray; let it breathe. Pre-heat the oven to 180°C. 2. Take half of your garlic and chop it finely, then put it in a cup. Using the kitchen scissors, chop the chillies and a few sprigs of rosemary and thyme. Put those in your cup, too. Add a hefty teaspoon of mustard, some pepper and chilli salt (just ordinary sea salt will do, if you haven’t got chilli salt). You can add a little splash of olive oil too, if you like. I don’t always, but sometimes I do, and then it is gold. 3. Peel and grate the ginger, if you have a little grater, or you can just chop it if not. It’ll be OK. Add most of it to your cup with the garlic and herbs. Put the last pinch into a mug with the honey. Boil a kettle. 4. Take the lemon and cut it in half. Juice one half very briskly, and the other half a little less briskly. Pour most of the lemon juice into your cup of stuff. Stir. Pour the rest of the lemon juice into the mug with the ginger and honey. Add hot water from the kettle. Stir. Drink. Steady yourself. 5. Go back to the chicken. Unloop the elastic string holding its little legs together, and shove four of the garlic cloves and the less squeezed lemon half up its little bottom. Loop it up again, if you can, then rub the garlic-chilli-herbs-ginger-lemon mixture into the chicken skin; into the legs, the thighs, the wings. 6. Slide the chicken into the oven. Set the chicken timer (your timer might be different, but mine is shaped like a little red hen) for about one hour and 20 minutes, if your chicken weighs the same as mine, and your oven is temperamental in the same ways as mine. If your chicken is bigger or smaller than mine, give it about 30 minutes per 500g (there are very accurate roasting-time calculators online: I use the BBC Good Food one). 7. Have a cup of tea. 8. When the timer rings, check the chicken. I am very bad at testing when a chicken is done, but I know in theory – something about sticking a skewer into the meatiest bit of the leg and the juices running clear. If it’s still pink, send it back to the oven. If not, turn the oven off and let the chicken sit for five minutes. Dip some bread in the juices. 9. Carve the chicken. Tear the meat from the bones. Drink. Eat. Feel glad.